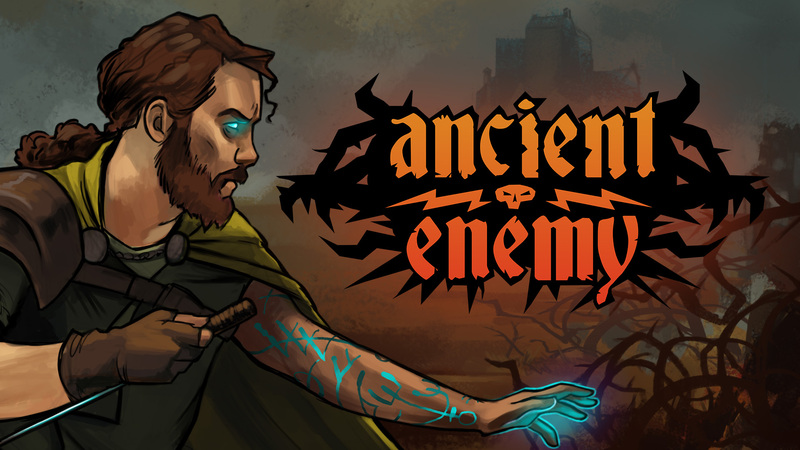 Bridport, UK, 23 October 2018 – Grey Alien Games, the independent development team behind Regency Solitaire, and Shadowhand, has today revealed their forthcoming title, Ancient Enemy. An unusual, strategic RPG card game, Ancient Enemy is launching on Steam for PC & Mac next year. You’ll embark upon a quest inspired by British mythology and the Mabinogion, so expect card battling, visceral fights, mixed with bleak and evocative folklore! Loot the fallen to fill your hero’s RPG-style inventory with collectible cards, capture strongholds and gather talented henchmen. Only powerful magic and iron determination will enable revenge upon your ultimate foe. A collaboration between Grey Alien Games and Big Robot’s Jim Rossignol, and featuring art by Jen Pattison, this is a project that brings together indie development talent from across the UK. “This is a long-overdue collaboration between myself and Jake,” said Rossignol, “and it’s fantastic to be working with Jen, whose art I have admired for years. We’re all having a lovely time.” Additionally, Ancient Enemy is supported by Bithell Games. – Card-driven, turn-based battles. The new, faster, turn-based combat puts the focus on the player’s choices. – Strategic challenge. Play your cards wisely. Your enemy’s next move is revealed, and you must respond accordingly. – Legend! Draw power from the stone circles, drive back the blight. Crack open the secrets of the dark land, and see the myths spill out! – Painterly production. Jen Pattison’s exquisite painted style brings Ancient Enemy to life with expert vision. Jim Rossignol is a writer and developer. He co-founded Rock, Paper, Shotgun in 2007, and then the micro-studio Big Robot – best known for the smash-hit survival epic, Sir, You Are Being Hunted – in 2010. Grey Alien Games, based in Dorset, UK is an indie game company run by husband-and-wife team, Jake Birkett and Helen Carmichael, and has shipped more than ten commercial games over the past decade, including Spooky Bonus, Regency Solitaire and Shadowhand. Jen Pattison is an illustrator & concept artist working in games, TV and film. She has previously worked on GAP Project, Steam Marines 2, Quest for Infamy, Roehm to Ruin, Order of the Thorne, and Serena, and has worked with clients including Disney, Twitch, and Komixx. This entry was posted on Tuesday, October 23rd, 2018 at 10:52 am and is filed under Grey Alien Games, Press release. You can follow any responses to this entry through the RSS 2.0 feed. Both comments and pings are currently closed.